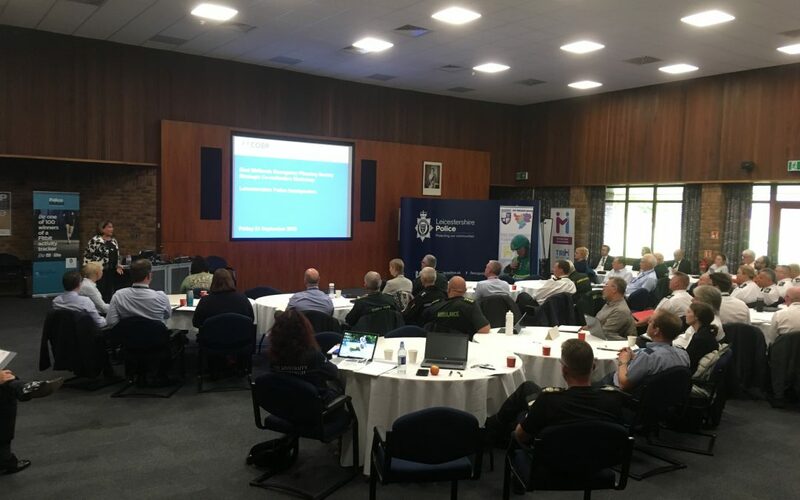 It isn’t often that any workshop planned for a Friday draws a full crowd but the strategic coordination event hosted by Chair of the East Midlands Branch, Andy McCombe, all but filled the lecture theatre at Leicestershire Police HQ on the 21st September. Delegates from across the East Midlands were there to participate in training that I have never before seen shared outside of Westminster, namely delivery of key modules from the Central Government Emergency Response Training (CGERT) course. Facilitated by Helen Braithwaite OBE, until recently co-opted from MHCLG to the Civil Contingencies Secretariat, she gave a thorough explanation of the inner workings at Cabinet Office Briefing Room (COBR) in an informative and refreshingly candid style of delivery that took the event to a whole new level. Chief Constable Simon Cole of Leicestershire Police not only hosted everyone but helped drive proceedings forward by sharing his own experiences of engaging with COBR during a recent counter terrorism exercise. His anecdotes served to illustrate some of the tensions and challenges that can exist between the local and the national elements of a crisis response whilst his practical tips for dealing with them were much appreciated by all. It was good to see some active networking take place between delegates from a wide range of agencies throughout the day and particularly at lunchtime. It was of course ‘Fish & Chip Friday’ in the police canteen, which always help to sate appetites and cement good working relationships. Even more reassuring, everyone returned for the second part of the day, which is always an indicator of how relevant an event is proving to be. By carefully avoiding the over-used approach of inter table exercise most often seen at this type of event, the organisers made the whole day feel fresh, inclusive and energetic. After a brief overview of the Government Liaison Officer role at a county Strategic Coordination Group, Andy McCombe took the last half hour to bring everyone right up to date with ongoing developments in national flood rescue capabilities and shared his revised presentation on Military Aid to Civil Authorities. The use of several PowerPoint slides embedded with a military drum roll was clearly unintentional but brought a smile to the face of everyone. This was a truly engaging CPD event and those who made the commitment to travel to and from Leicestershire on the last day of their working week will consider it time well spent.